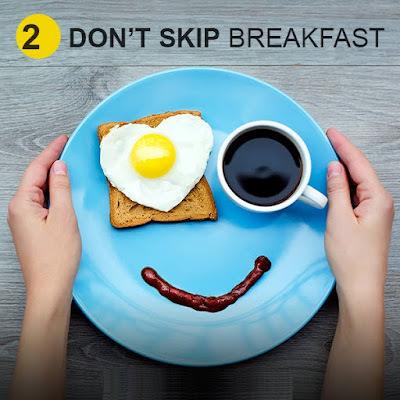 2: Don't skip your breakfast? it's about if people eat more in the morning and less at night Amazingly lose more weight at the same time as other lose less. Many research suggest starting a day with high protein and meal is good for fitness And especially warm and solid foods help you to feel fuller and less hungry later. Around 300 to 400 calories with at least 25 grams of protein say” Domenica Rubino MD director of Washington Centre of weight management and research. 0 Comments "Don't Skip Breakfast to improve weight loss results/Tip no 2"